Although I enjoy attending big airshows that feature demo teams flying thundering jets, such as the Blue Angels and Thunderbirds, I've come to really enjoy the smaller airshows. These smaller venues offer closer and more intimate contact with the people and flying machines, and often provide the opportunity to view aircraft not normally seen elsewhere. I've attended two of these smaller events recently--the first at Rush City, MN (featured in this gallery), and the second in Granite Falls, MN (photos coming soon). On Sunday, June 10, 2012, the Rush City (Minnesota) Airport hosted its annual Fly-In and Drive-In. On display were dozens of classic cars, many old tractors, and of course, aircraft. My being an aviaphile, I focused my attention on the aircraft. The day's weather was hot, with a strong southerly wind--this did not deter the fliers. Attending were beautifully restored and maintained civil aircraft, such as a Luscombe and Piper Cub. There were a number of old warbirds--T-6 Texans, O-1 Bird Dogs, a BT-13 and an OH-6 Cayuse. The stars of the show were the classic Stinson Tri-Motor and the CAF's B-25. Here is a glimpse of the event--Enjoy. 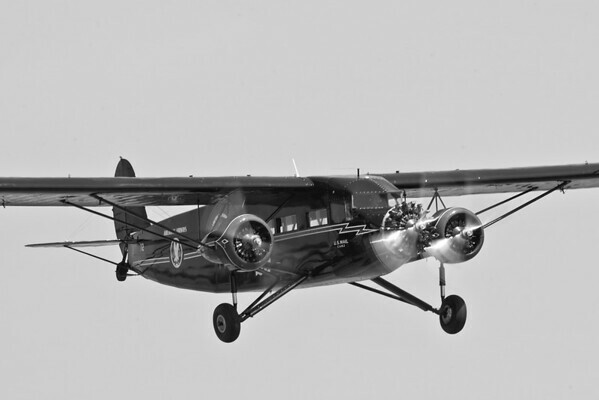 The beautiful Stinson Tri-Motor, rendered in black-and-white.